Legogirl's Cabin of Adventure........: June's quilt block .........Late!!! Well this is late!!! Sorry. June has been a strange month, it all started so well, lots of things to do and lots to share. Until "life stopped by, for a reality check" Nothing major no lives were in danger, just my washing machine!!!! I killed it, big time!! It has gone to the recycle bin. Simple I thought just buy a new one! This is were life gives you a kick up the bum and three washing machines later!!!! Long story short, I found a shop that I could collect a washing machine, Hooray !!!! only took three hours on the internet. Washing machine arrived home in the back of my car, unloaded, unwrapped and a big dent in the back. Phoned the shop, took it back, so sorry here is a new one. Got home unloaded, unwrapped and got to work. Why!!!! only two days without a washing machine does the laundry baskets look like I have not washed clothes for weeks????? Six days later it broke, phoned their repairs department to have it fixed, the next available day for an engineer was 5 days away. So phoned the shop took it back the next day and third washing machine later its working. 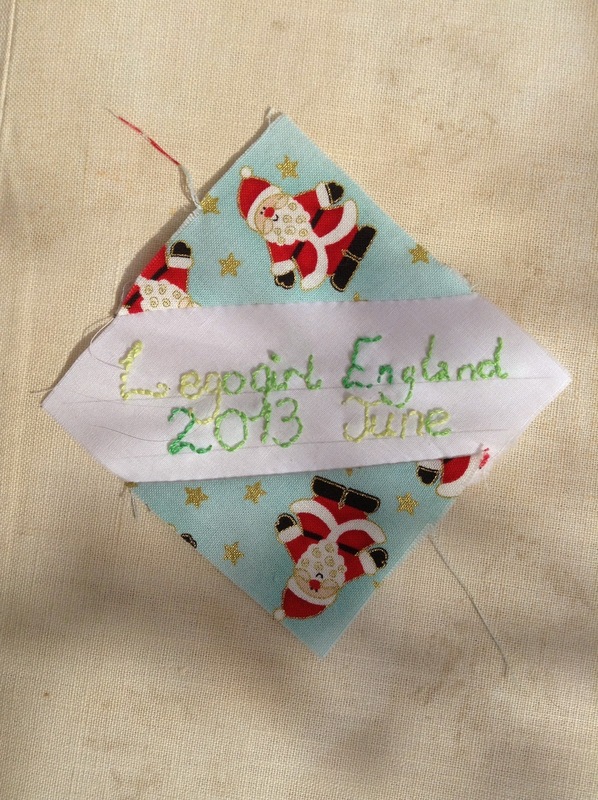 Right, June's quilt around the world block, the Queen for the month lives in Australia and asked us to make the quilt block called "Scrappy Trip Along". 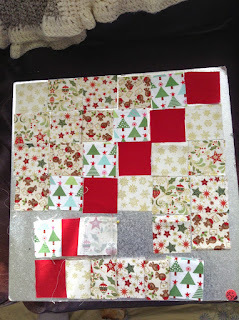 I chose 6 pieces of fabric including red as asked for and then cut 6, 2inch squares from each one, totalling 36 small squares. 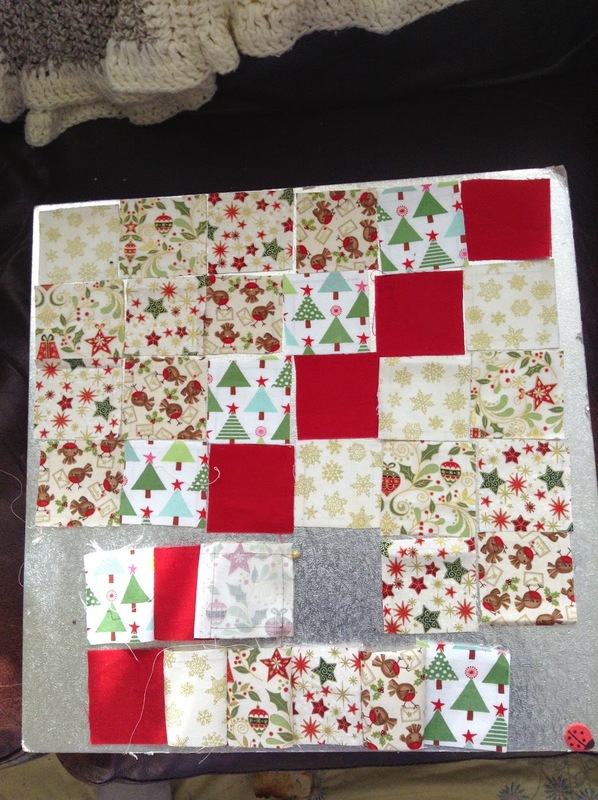 Here they are all laid out, the bottom row is sewn together. 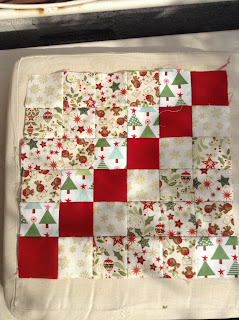 It was such a lovely block to put together, never done this block before, but I shall now. 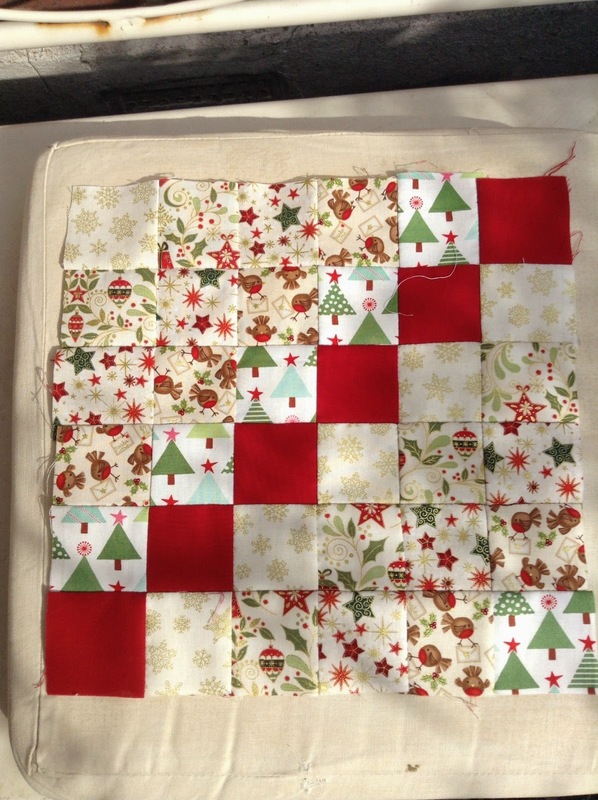 Can't wait to see this quilt completed, its for Christmas , if you have not guessed! The red is to symbolize Santa rushing around the world to complete his Christmas run before the children wake. So cute!! 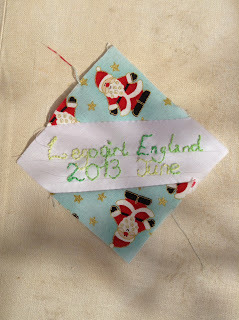 Then to go with this quilt block we were asked to make a label, for the back of the quilt. A little keepsake for years to come. 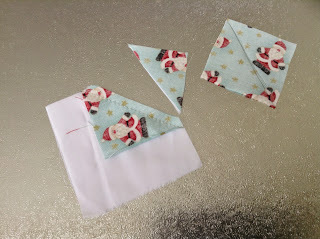 You will need to cut one 3.5″ square of solid white fabric, and two 2.5″ squares of your Christmas fabric. On the backs of each of your patterned squares, draw a line from one corner to the opposite corner This will guide your sewing line. Line up your patterned squares face down on the corner of your solid square. Make sure that your corners are flush and that the line you drew touches the edges of the white square. If you want to be on the safe side, have them line up so that they are just past the edge of the white square. Sew along the drawn line. 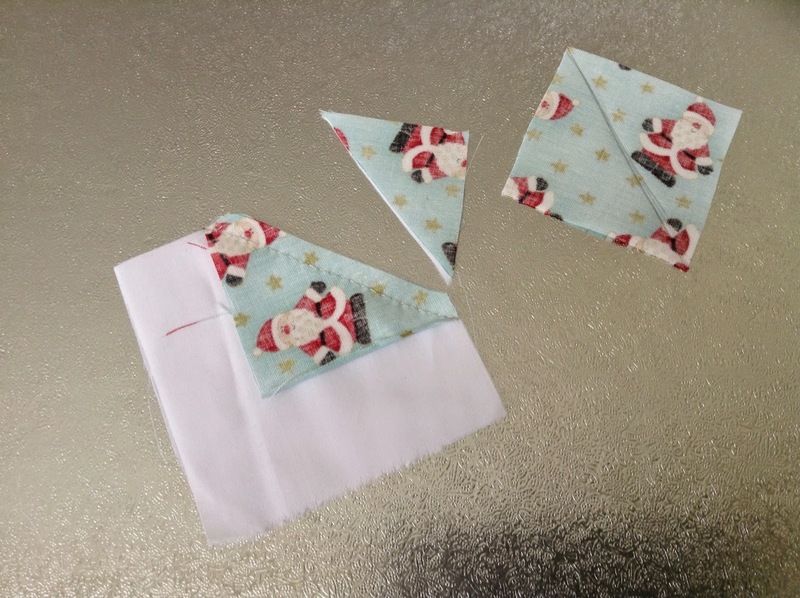 Trim your fabric for a 1/4″ seam allowance. I then embroidered my name but you can write it using a permanent pen. Now they have been sent off to Australia. 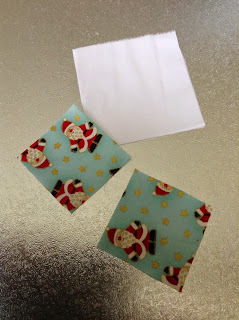 Thank-you for stopping by, sorry for taking so long to blog, life just gets in the way sometimes!!!! or should I say "washing machines"